Learn more about GIS, with users from every corner of the State. 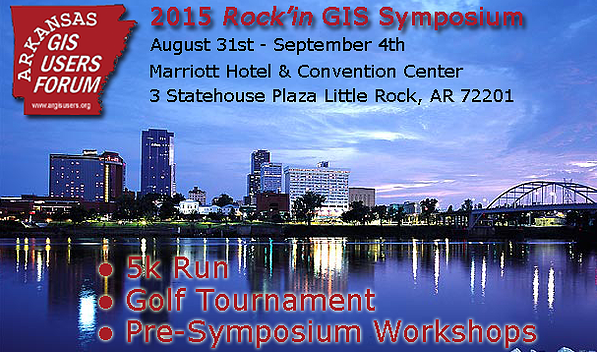 The Arkansas Geographic Information Systems Office (AGISO) in partnership with the Arkansas GIS Users Forum is offering a registration grant for one full conference registration ($400) to attend the 2015 Arkansas GIS Users Forum Symposium, on August 31st to September 4th, 2015 in Little Rock, Arkansas. This symposium provides an outstanding opportunity to access GIS Short Course training, and learn from other GIS personnel who can share their experiences. The goal of the Grant is to reduce County cost to send their staff to attend the Symposium and access training for County employees. Any County personnel in Arkansas that are actively participating in creating or maintaining GIS data or are participating in the Parcel Mapping Grant Program in the Arkansas GIS Office platform. The County shall not receive a cash award from the Arkansas GIS Office nor the Arkansas GIS Users Forum. The grant amount will be deducted from the awarded applicant registration. The attending employee must at minimum enroll in one (1) Pre-Symposium Workshop. The County or employee shall be responsible for all other cost associated with attendance, travel, lodging, meals, etc. The County shall be responsible for completing the applicant conference registration and short course registration named on this application. AGISO shall notify award recipients no later than Tuesday, August 3rd, 2015. The County shall be responsible for all travel arrangements. AGISO shall be responsible for Conference Registration payment for award recipients named on this application. APPLICATIONS RECEIVED AFTER THE DEADLINE DATE WILL NOT BE ELIGIBLE. Applicants must gain the approval of their County Judge or County Assessor. The application must include a letter signed by the County Judge or County Assessor. ← Image Services Now Available!